A GROUP OF independent TDs have insisted they are not on the brink of forming a new political party following fresh speculation that an entity calling itself the ‘Left Alliance’ will be launched in the autumn. A Sunday newspaper report suggested that a group of left leaning independent deputies will seek to form a party later this year. 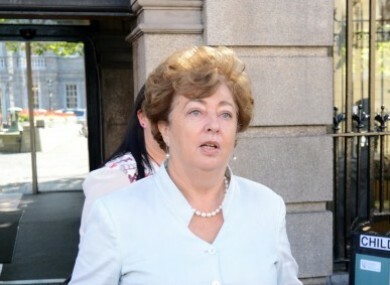 But at the MacGill Summer School yesterday, Kildare North TD Catherine Murphy said “there isn’t a party being formed called the Left Alliance that I am involved in”. Murphy is part of the Independents’ Network, a loose alliance of non-party candidates, which saw nineteen of its 36 members elected – two MEPS and seventeen councillors – at the last local and European elections. The success of the alliance has fuelled talk of a new party, but although a conference is being organised in the autumn TDs have played down suggestions it is the prelude to a new party. “There are a few of us looking at organising a conference around a few themes that are going to be dominant themes in the political landscape into the autumn. That is it, end of,” Murphy told TheJournal.ie in Donegal yesterday. She said that the conference would focus on several themes that are going to be on the political agenda in the coming months such as housing and personal debt. “It’s not about coming to conclusions and defined policy positions,” she insisted. Donegal South West deputy Thomas Pringle said he “certainly” doesn’t want to be part of a new political party. “The intention of what we’re trying to do is not in terms of developing a political party or putting it into that space. I think we’ve been badly served by the political party system and there is no appetite amongst any of us to feed into that same system,” he said. Waterford TD John Halligan, whose comments last weekend had fuelled speculation about a new party said “there’s not a party being formed and everyone knows that”. “We’re trying to form a grouping that will give the 25 to 30 per cent of people that are voting independent a voice,” he said. However, Halligan did acknowledge that he and other independents are “under fierce pressure” to form an alliance and said that moderate left people who voted Labour in the last election no longer have a voice. Lucinda Creighton, who is part of the Reform Alliance, told the MacGill Summer School yesterday that there was a “window of opportunity” to form a new party that was possibly closing. Speaking to reporters in Donegal yesterday, the Dublin South East deputy said that “the time is coming when people have to make decisions”. “We don’t know when the next election is, I think that is probably sooner than people might have realised before the local and European elections. So people need to start thinking about getting organised and preparing,” she added. Email “Left Alliance? Independent TDs deny that they're about to form a new political party ”. Feedback on “Left Alliance? Independent TDs deny that they're about to form a new political party ”.